Apple’s secretive industrial design lab shown off in redesigned jobs site — Jony Ive’s design team has begun to emerge from the shadows, with some of Apple’s elite cadre of designers featured on the company’s revamped jobs microsite in a photo (above, which reveals virtually nothing) apparently taken within its top-secret industrial design lab. OS X’s four Finder views explained — OS X Yosemite (and like most of the previous versions of OS X) has four different views for navigating your files: Icons, List, Column, and Cover Flow. Each is distinctly different, and each has its own strengths and weaknesses, but if you learn them it will make navigating your Mac much easier and more productive. Adobe reveals Document Cloud, Acrobat DC with e-signing, photo PDF conversion, more — Adobe has unveiled Document Cloud, an all-encompassing digital document management solution that includes a new touch-enabled version of Acrobat and two iOS-specific apps. Upcoming Steve Jobs biography exposes Apple co-founder’s final years, succession plans — A new excerpt from the upcoming biography Becoming Steve Jobs illustrates some of the lesser-known aspects of the Apple co-founder’s life, including succession plans, his decline, and his involvement with Campus 2, the new Apple headquarters under construction in Cupertino. How to Launch OS X Apps from the Command Line —John Martellaro shows you how to launch an OS X app from the command line with the open command. 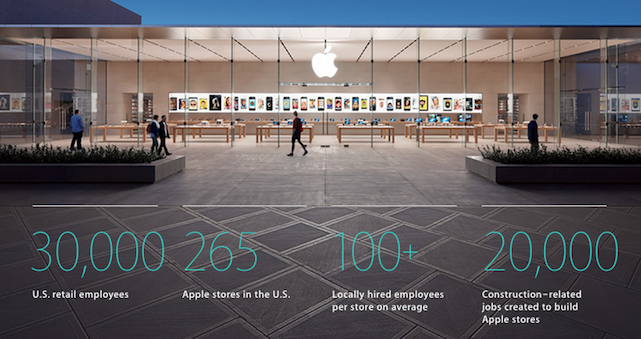 Report reveals how many jobs Apple is responsible for in the States (image from TUAW). OS X Spotlight Search glitch can expose your IP address and other details to spammers — If you use Spotlight Search and the OS X Mail application, you should take a moment to look at your settings. A recently uncovered glitch in Spotlight Search for OS X may leak private information, such as your IP address, to email spammers. At the moment the only way to fix the glitch is to turn off Mail & Messages in your Spotlight settings in the System Preferences of your Mac. Judge dismisses lawsuit alleging Apple knowingly released MacBook Pros with faulty logic boards — With class action suits against Apple seemingly initiated every few weeks, it’s easy to keep track of what’s happening where. That said, you might recall a suit recently levied against Apple alleging that the company purposefully sold MacBook Pros circa 2010/2011 that it knew contained faulty logic boards. It has been dismissed. The best external monitor alternatives to Apple’s outdated Thunderbolt Display — The last time Apple updated its in-house external display line was 2011’s Thunderbolt Display, but with no clear signs that a refresh is imminent, AppleInsider has put together a list of the latest and greatest monitors. Worldlabel.com releases free Pages for Mac label templates — As much as we’re all trying to reach that elusive paperless world, reality forces us to use printers more often than we’d really like to. Pages for Mac users can often run into issues when trying to print adhesive labels simply because those handy label templates aren’t available for Pages. That’s all been resolved today by Worldlabel.com, which has created a complete library of Pages templates for well over a hundred different label types. Apple Inc. stock leaps nearly 4 percent in first surge of 2015 — After being pushed downward across the first week of 2015, Apple’s stock surged $4.14 to close at $111.89, adding over $24.27 billion to the company’s market capitalisation. How many jobs Apple has created in the United States — Apple currently has 66,000 employees working directly for them in the United States, but beyond that direct employment how much impact has the company from Cupertino had on American job growth? Thanks to a report from Apple we now have an idea, and the number is big.